How Do Oriental Rug Cleaners Deal With Dye Stability Issues? 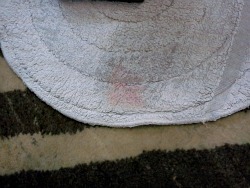 The temptation for experienced oriental rug cleaners is to skip dye stability testing. You get to a point over time where you are "ninety-some" percent sure a rug won't have any problems. Of course, that doesn't help if, in fact, the rug experiences some issues during cleaning or drying! The answer to avoiding these issues with potential "problem" rugs is to test, test, test. Without thorough testing there is no way to plan and prepare for safely washing a rug. Every cleaning solution should be tested on every color contained in the rug. That is the only way to be sure there will be no unwanted "excitement" during the washing and drying phase. Sometimes, as in the case with urine contaminated rugs, hard choices have to be made. Urine deposits, especially old deposits that have sat for weeks or months or longer, can cause otherwise stable dyes to become unstable. The presence of urine in a rug raises the probability of dye bleeding considerably. Even so, the only way to remove urine contamination from a rug is to fully and completely wet wash it. The rugs owner, in consultation with the oriental rug cleaner, must decide what degree of remediation to utilize and what degree of risk to accept. 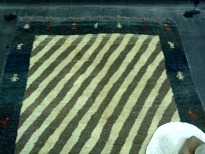 The rug to the right is a Gabbeh with extreme dog urine damage. It's hard to tell from the picture but there were dozens of urine deposits across the face of the rug. At Pro Care Cleaning we always test each rug and furthermore we test every single color in the rug! We were not expecting this rug to have any bleeding issues. We were mistaken! What you see in the following picture is red dye that has transferred onto a white bonnet pad. Not only was there dye movement with the red dye but it was instantaneous! What to do with the rug? It was full of urine so it had to be washed. At the same time the red dye was just waiting to make a mess of things! 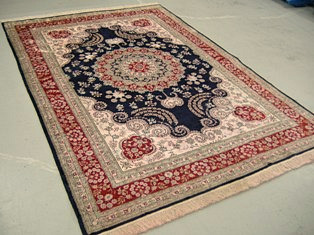 The rug below is a silk rug, previously contaminated with urine. After a truly heroic cleaning effort by a Canadian rug cleaner, the rug still bled red dye into the white field. There are remedial steps and cleaning solutions that can be utilized to try to correct this, but in the end, there's no guarantee of success. Our promise to you is to always communicate with you about any issues your rug might experience. If the rug shows a proclivity towards dye bleeding during testing we will call you and discuss what our options are. We will not take action without consultation with you when it comes to rug safety issues. The only thing less desirable than dye bleeding, which is defined as dye migration in the presence of moisture, is crocking. Crocking is defined as dye migration in a dry state. This situation is very dangerous, because the dye is so loose, any attempt to wet clean it will cause unwanted excitement. Crocking is frequently due to wool not being washed after initially being dyed. There are a couple of different options with rugs that crock dye. The first would be to dry clean the rug. The disadvantage of this approach is that it does little for urine damaged rugs or heavily soiled rugs. The second option, much riskier, is to apply a dye set chemical and then wash the rug until the dye stops coming out. Thankfully, this situation is very very rare! Again, communication between you and your oriental rug cleaner is the key to a positive outcome.